Is it possible to make chocolate italien buttercream? How would you do that? Great question! Yes you can. After you’ve made your buttercream fold in 12oz of melted and cooled bittersweet or dark chocolate. Can you keep the buttercream in a fridge and if so for how long? As long as it’s in an airtight container up to two weeks in the fridge. Does it need to be refrigerated if you make it just a day or two early? Hi Amanda — It is best to do that because it is very soft at room temperature so it melts very easily. Hope that helps! Best, John. Will it work out as fluffy as it looks in the video if i make it with hand mixer? Hi Kato — I have never done that before because it seems like such a pain to attempt. If you do, please let me know how it goes! Thanks, John. Approximately how much does this recipe make? Could I frost a three layer cake with one batch? Thanks! Hmm, yes, you could frost a three layer cake I think… My stand mixer bowl is usually almost half-way full if that helps. 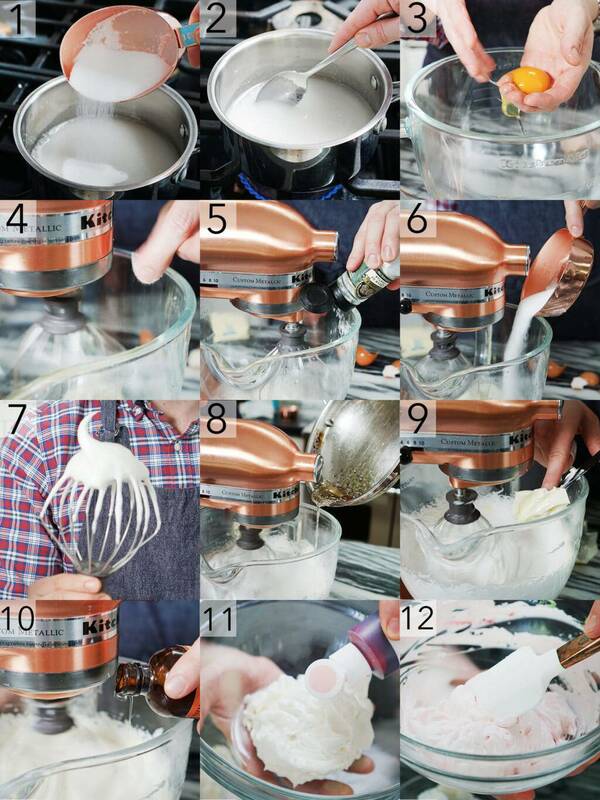 Can you make this with a hand mixer or by hand? Hi Romy — Yes. Either work but you may be standing there for 20+ minutes. Ha-ha! In your picture the frosting cord are very pretty. At what point did you add the color and what did you use? Hi Amber — I add the color in at the end and I used gel colors. Thanks, John. Hi Virginia — The icing is fairly stable and should be able to last that long. That said, I don’t recommend it. Refrigerators tend to alter the consistency of the cakes/frosting. Let me know how it goes! Best, John. That icing is beautiful. It looks like antique white satin fabric. If I frost my cupcakes, is it ok to leave them out at room temp? They don’t need to be refrigerated after do they? Hi Abbi — It depends on a) how hot is, and b) now long they are staying out. It’s fine to put them out for a few hours as long as they’re covered BUT you may want to refrigerate them if it’s going to be for a day or so. Thanks, John. A couple of notes from my experience: you can use cold butter ( keep out of fridge while whipping the meringue). If you do – the egg whites should be slightly warm – reduces overall time if you are in a hurry but requires a bit of experience in judgment. Also it is safer to switch to a paddle attachment while adding cold butter to avoid bending the whisk. I find it keeps for up to a month if properly stored. 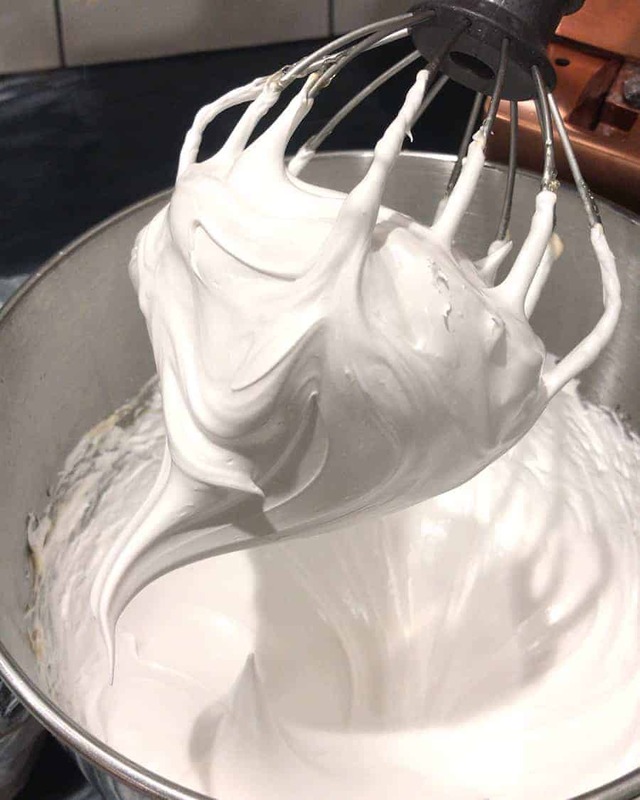 Do you ever make Swiss meringue buttercream? I find myself less successful at that. Hi Ela — Thank you for all your input! I’ll definitely try this in the future. Thank you. Also — I’ve never made Swiss Meringue. What does it taste like? How difficult is it to make? Best, John. It’s fluffy like Italian Meringue, but not as rich tasting. Hope you liked the recipe! It’s my favorite buttercream to make! I think it is similar—silky smooth and not too sweet. I find it easy because you just pop the whites & sugar in the mixing bowl and whisk over Bain Marie. I don’t use a thermomter, just rub it between my fingers until there ya no gritty feeling. The beat with whisk til bowl is neutral to cool. Then add butter. Easy to flavor too. Give it a try! Hi Mary — The recipe has been fixed. Thanks, John. Just read your recipe and I think that you forgot to specify how much of the sugar to use in the first step and how much to use in the second step, making the simple syrup. Can you clarify this for me. Thank you. Hi Eliz — The recipe has been fixed. Thanks so much! Best, John. HI John, Your recipe calls for 1 1/2 C sugar. In step 1 you say to add the sugar to the egg whites, cream of tarter and salt and beat to soft peaks. In step 2 you advise to add remaining sugar to a saucepan with water. Can you tell me what amount of sugar is used for step 1 out of the 1 1/2 c sugar called for in the recipe? Hi Donnna — The recipe has been fixed. Thanks so much! Best, John. 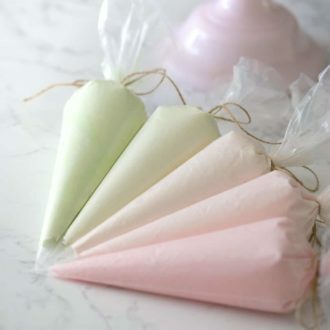 Would this recipe be suitable to use for cupcakes at an outdoor summer wedding? Hi Shelley — Yes! Let me know how it goes. Best, John. 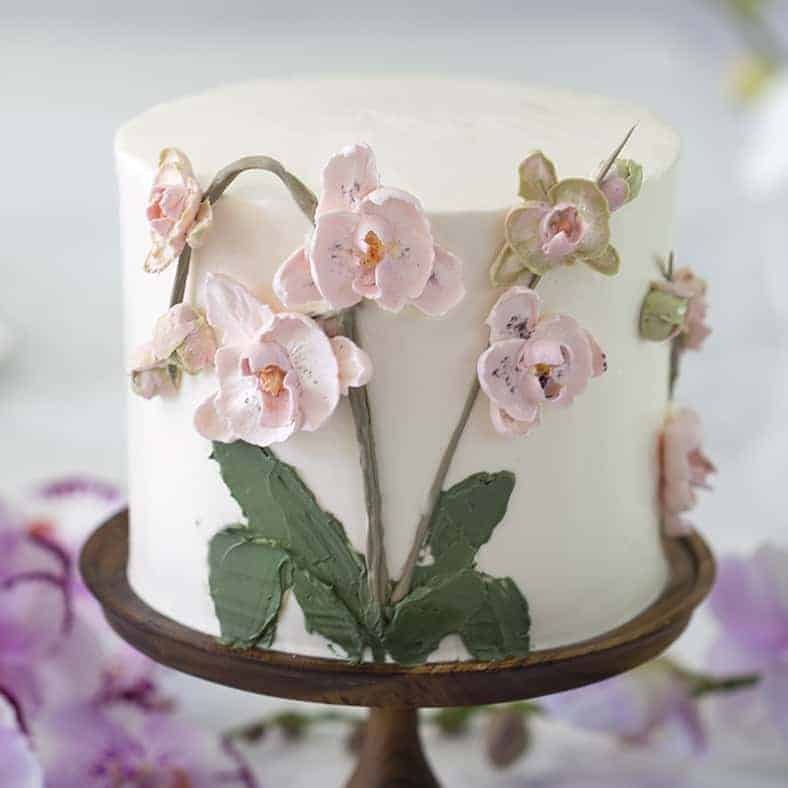 What brand of gel colors did you use and the color you put in for the frosting you made…it’s absolutely gorgeous and very vintage looking !!!!! This is a great recipe ???? Hi Angie — I use Americolor! Every color they sell is great. Hope this helps! Best, John. Hi! 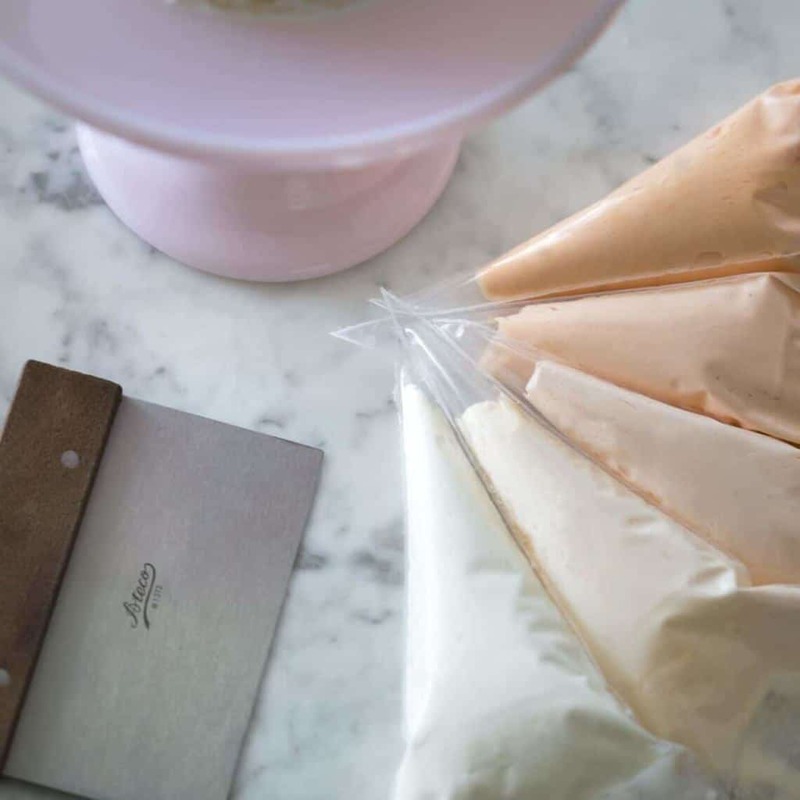 Can the icing be made and frozen ahead of time? You can use salted butter in this recipe! Just omit the pinch of kosher salt! Hi , can i use salted buttercream for this recipe ? Will it hv the same consistency like unsalted butter? You won’t be needing the egg yolks for this buttercream, but you could always save them for another recipe! I usually make a fruit curd to use as a cake filling with the yolks. The availability of frozen fruits makes it easy. My latest batch of cupcakes was a vanilla bean cake, filled with strawberry curd, topped with white chocolate Italian buttercream and finished with a drizzle of fresh strawberry coulis. So yummy! That sounds delicious! Hope you enjoyed the recipe! Hi, my buttercream always has a yellow tinge to it. Do you have any tricks to give it a crisp white colour? Use a cheaper, paler butter! It’s always best to use quality ingredients, but in this case, your butter is turning the buttercream yellow! Need help, I had to improvise not having a thermometer or a stand mixer. I followed the directions otherwise. I ended up with creamy scrambled eggs, or cottage cheese. I improvised and mixed with cream cheese to have a useable frosting… but before I attempt again, help please! Does that mean too much mixing? Too hot of syrup? Not warm enough syrup? The temperature is how important? The stand mixer is very much needed because you’re whipping constantly for 20 minutes or more! The temp is also very important, it needs to be at the soft ball stage! There are videos online to show you how to test without a thermometer! Hope that helps! Looks great! how much frosting would this recipe yield? This recipe yields 792.4 grams of Italian buttercream! Hope you enjoy! John, how big of a cake will this recipe cover? Thank you! A six egg white recipe will cover a five layer cake, so this should cover three, I would think.